United Arab Emirates-based marine and industrial engineering company NICO International and Italian repair provider and technical supplier Teknoship S.r.l used this year’s Posidonia exhibition as the occasion to mark the signing of an exclusive ‘Territorial Partnership Agreement’ formulated to offer mutual benefit to both companies. Prakash Kumar and Antonio Trani, the companies’ respective general managers, were both present to provide their signatures. The agreement will see Teknoship S.r.l promoting NICO International’s services in its home country of Italy, the wider Mediterranean region, and further into northern Europe, whilst NICO International will return the favour for their partner in the Arabian Gulf. The respective location of each company means that they are well-placed to attract vessels trading on the Asia-Europe route, with thousands of ships a year passing through Arabian waters and the Mediterranean en-route to northern and western Europe. NICO International in particular is looking to exploit its position in the Persian Gulf, defining the company as a ‘One Stop Shop’ for repairs, reconditioning, and surveys. The added business from Italian and European shipowners gained from the agreement should complement the company’s strong track record for repeat business, which sits at 50% of all work completed. Speaking with NICO International at Posidonia, Shiprepair and Maintenance was informed of further agreements to accommodate outside distributors within NICO’s Middle East region, including power generation, industrial, and marine electrical systems companies Jeumont Electric S.A.S, Nishishiba Electric Co, and Sunrui Maritime Environment co. for their Ballast Water Management Systems. They will join a range of partners including J-ENG, Veth Propulsion, Mitsubishi and Metaldyne. 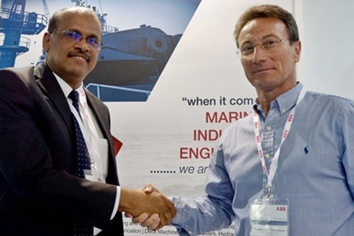 At Posidonia, NICO International also entered into a memorandum of understanding (MoU) with UK-based Cleanship Solutions, which specialises in ballast water management and exhaust gas cleaning retrofit engineering. This will allow NICO International to ‘reinforce its capabilities’ with regard to this equipment, and broaden the market in the Middle East, giving Cleanship Solutions “a strong local base” according to managing director Chris McMenemy.